Juniper Networks SRX3400 Services Gateway is next-generation services gateways that delivers market-leading scalability and service integration in a mid-sized form factor. This device is ideally suited for medium to large enterprise and service provider networks. 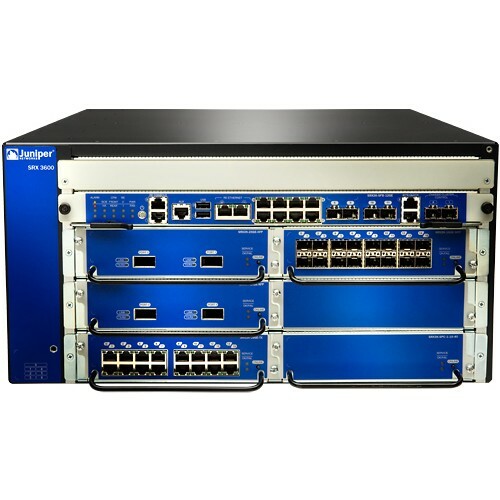 Based on an innovative mid-plane design and Juniper’s dynamic services architecture, the SRX3000 line resets the bar in price/performance for enterprise and service provider environments. Each services gateway can support near linear scalability with each additional Services Processing Card (SPC), enabling the SRX3600 to support up to 30 Gbps of firewall throughput. The SPCs are designed to support a wide range of services enabling future support of new capabilities without the need for service-specific hardware. Using SPCs on all services ensures that there are no idle resources based on specific services in operation-maximizing hardware utilization.